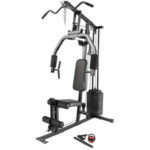 The Marcy MKM-81030 home gym is a lot similar to the MKM-81010 model that we’ve previously reviewed here. There are several differences between these two units, though. For example, the MKM-81030 includes a lighter weight stack, doesn’t come with a preacher pad, and has different grips for the front press. It’s not a bad home gym for beginners, and maybe one of the best parts about it is that it doesn’t break the bank. 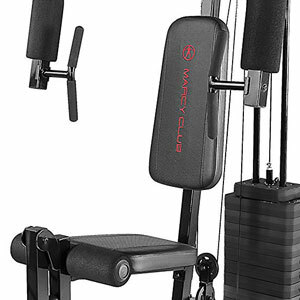 The Marcy MKM-81030 is a rather small home gym compared to other models, such as the Body-Solid G2B, for example. With the frame fully assembled, it’s only approx. 56.5″L (144 cm) long, and 34″ (86 cm) wide. Of course, it is recommended to leave some clearance on each side and at the front for safe operation and ease of access, but still, the whole unit shouldn’t take a usage surface larger than 80″ x 60″ (203 x 152 cm). Also, its highest point is approx. 79.5″ (202 cm); therefore, the unit should fit with no problem in a room with a 7′ (213 cm) ceiling. As a small conclusion here, due to the rather small frame, the MKM-81030 is not a home gym for tall persons. Taller users than 6’0″ (183 cm) may not benefit from a complete range of motion for all the exercises. Needless to say, the frame of this Marcy home gym is made of durable steel tubing. All the steel parts in its construction are coated with a corrosion resistant paint finish. The color used is black, this being the only version available for this machine. The fully assembled unit is not extremely heavy. It weighs approx. 190 lbs (86 kg), though, so once it is assembled it’s not recommended to be moved. This weight, plus your own weight, provides plenty of stability. The unit’s seat and backrest are non-adjustable. They attach directly to their bars via screws. They have approx. 2.5″ (6 cm) of foam padding providing optimal comfort. Also, their upholstery is made of a durable synthetic mesh and vinyl combo. Although the seat and its sustaining bar seem pretty durable, the weight capacity specified for this machine is 300 lbs (136 kg). The Marcy MKM-81030 is equipped with a multi-pulley system. It actually integrates 14 pulleys; they’re made of heavy-duty nylon material and integrate industrial-quality, stainless steel ball bearings for smooth operation and a long lifespan. The integrated cables are rated for 2,000 lbs tensile strength. They’re steel made and coated with a vinyl sheet for a smoother travel over the pulleys. Each workout station has its own set of cables, so you don’t have to swap them between exercises. The front base of the machine doesn’t have a wide foot resting plate like the Marcy MWM-6150, for example. However, the two small foot plates should provide plenty of support and stability during low pulley exercises. 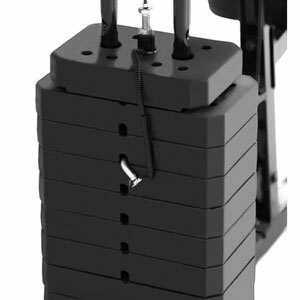 Also, the unit doesn’t have adjustable stabilizers, nor it has holes or screws for anchoring to the floor. The unit can be anchored to the floor, though, through extra improvisation. In terms of accessories, the Marcy MKM-81030 includes quite a few. To begin with, the EZ lat bar with an extension chain is included. 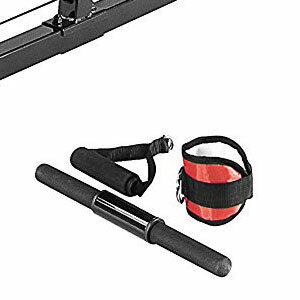 A short curl bar, an ankle cuff, and a standard D-handle are also included with this home gym. High pulley station. This workout station features only one pulley; it offers the possibility to execute lat pulldown exercises, ab crunches, triceps press downs and others. As we’ve mentioned above, the lat bar is included; it’s an EZ type bar, featuring rubber-foam grips. Also, the D-handle can be attached to the top pulley for a variety of other exercises rather than lat pulldowns. Press station / Fly station. The front press of the machine offers double functionality. On the one hand, it fulfills the role of a front press. It has a triple grip design, with upper and lower parallel grips, but also standard grips on the sides. On the other hand, it’s also a fly press; each one of its arms can be pressed forward in order to execute pec fly exercises. Each one of the arms is equipped with a 4-inch thick foam roller for extra forearm and elbow comfort. Low pulley station. The machine’s front lower pulley can be used for a variety of exercises. For example, you can attach the short bar to it and perform bicep curls, seated rows, or standing rows. The short bar for curls and rows is included; also, an ankle cuff for various leg exercises is included. Leg developer. This is an attachment that depends on the low pulley. It’s pretty much a standard leg developer featuring four rollers, each one of them being 4-inch thick. This element offers the possibility to perform leg extensions or standing one-leg curls. 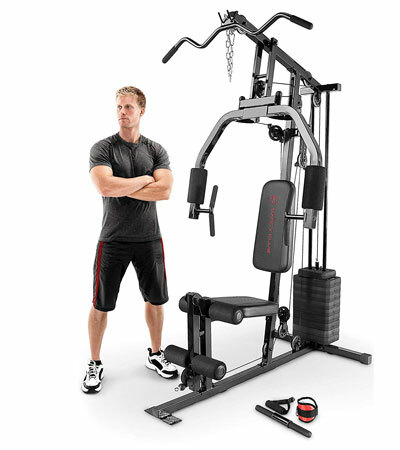 Similar to other Marcy home gyms, the MKM-81030 is equipped with a vinyl/cement weight stack. This is one of the reasons it is considerably more affordable than other home gyms with a cast iron stack. The weight plates are pretty durable, though, and considering that this is a home gym, not a commercial machine, they won’t take as much abuse as a unit in a commercial facility. The unit’s weight stack is composed of 9 main weight plates, plus the top selector plate. Each weight plate weighs approx. 10 lbs (4.5 kg), the total weight of the stack being approx. 100 lbs (45 kg). Due to the multiple pulley system, the weight resistance delivered by each workout station differs. For example, with all the 9 plates selected, the front press delivers a weight resistance of 135 lbs (61 kg), while the low pulley provides only 110 lbs (50 kg). 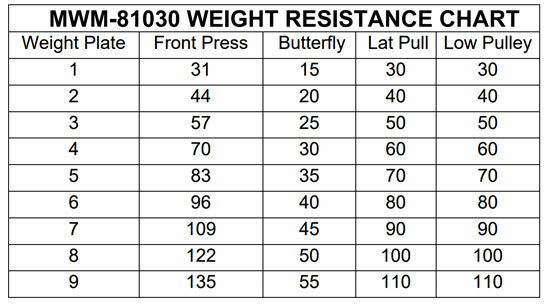 The table below shows the weight resistance chart for all the workout stations. For the fly station, the weight resistance in the table refers to each arm. The machine’s weight stack is not upgradable. Or, at least there aren’t any extra weight plates available for this machine. However, the pulleys and the cables are very sturdy, so you can improvise by adding extra dumbbell plates to the stack using a chain or a cable. This is not recommended, though. 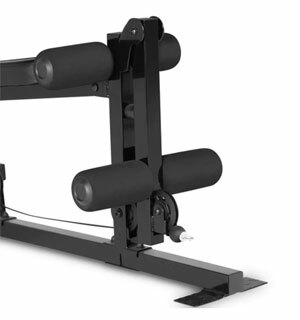 The Marcy MKM-81030 offers the possibility to execute more than 30 exercises. The list below covers approx. 20 of them, but with certain improvisation or other extra accessories, you should be able to perform more. Although it’s a rather basic home gym, the Marcy MKM-81030 will take more than 2-3 hours to assemble. It comes packaged in several boxes and there are many parts to put together. Thus, it is recommended to be assembled by two persons. Some of the tools required for the assembly (Allen wrenches) are included. You will also need an adjustable wrench, a Phillips screwdriver, and a rubber mallet. The included manual provides very clear assembly instructions and schematics, so the process shouldn’t be too difficult. Maintenance doesn’t require much, once the unit is assembled. The pulleys may need periodic lubrication, and for it, light oil is recommended. If lubricated during the assembly, the pulleys may not require further lubrication for a long time. Not a home gym for taller users than 6’0″. The weight stack is not upgradable. The Marcy MKM-81030 is an entry-level home gym, featuring 4 workout stations and attachments, and a 100 lbs vinyl/cement weight stack. It includes several accessories as well, such as a lat bar, a short bar, an ankle cuff, and a D-handle. Due to the fairly lightweight stack, we can say that this is a home gym for beginners, or for anyone who wants to tone muscles or get back in shape. It’s not a unit for extreme lifting. But nonetheless, it allows you to perform more than 30 exercises, and benefit from a full-body workout with each session. Finally, it’s an affordable machine, offering a pretty decent value for the price.